Frans Vermeulen’s popular materia medica, Concordant, was first published 17 years ago and was an instant success, understandably so. It was enlarged three years later.Now, for the first time in 14 years, Frans Vermeulen’s Concordant has been expanded, updated, revised and improved. The new Concordant Reference contains more information and more remedies and reflects the changes that have occurred in homeopathic techniques and scientific knowledge in recent years. 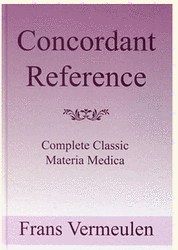 Concordant Reference builds on the foundation of the classic materia medica from venerated authors, bringing it all into the modern world of contemporary homeopaths, addressing their needs for accurate information. The identity of remedy sources has been checked and verified, as well as corrected when needed. 287 small and largely unknown remedies from Boericke. These 287 remedies have been buried in Boericke and, by and large, contain very small amounts of information. Virtually hidden, they were rarely, if ever, used and therefore homeopaths had no chance to develop more information and clinical experience. The beginning of learning how to use a remedy is to know what it is and where it belongs. Giving these hidden remedies an accessible place, they can become more known and their usefulness expanded. As current experience in homeopathy demonstrates, often a small or previously unknown remedy can yield brilliant results. Remedy names have been upgraded to current scientific nomenclature standards. Each remedy has its Latin and common name. There are formulas for mineral and organic compounds. A family division is given for plants, animals, fungi, bacteria and viruses. The term ‘Classic Materia Medica’ refers to the work done from 1790 – 1931, starting with Hahnemann and ending with Boericke and Boger. After that, there was a gaping silence for about 50 years during which there was almost no new information. The homeopathy renaissance we are still experiencing began around 1980. Under all new developments is the foundation from the classic authors and their important original work. Now added to the texts included in the previous Concordant are symptoms coming from T.F. Allen’s Handbook and his 10-volume Encyclopedia. The Sensation, Mind and Dream sections have been most enlarged, reflecting the recent developments in case taking, case analysis and prescribing that have shown to be so effective for today’s homeopath. The remedies most benefiting from the additional information are the medium sized and small remedies. Polychrests are so well known, there was hardly anything new to add, even after scouring Allen’s Encyclopedia for additional symptoms. Until now, remedies that fell into the category of medium and small were relegated to reduced status because they were considered to be useful only in a narrow sense as being indicated for specific organs or for limited local symptoms. Those who have the existing Concordant will find the familiar general layout, sections, symptom divisions and categories. Sections include – Generals, Mind, Dreams, Body areas, Modalities, Relations, Causations. From the standard repertory body sections, the sections of ‘Food and drink’, ‘Heart’, ‘Limbs general’, ‘Limbs upper’, ‘Limbs lower’ are split out for easier reference. There are three possible divisions in each section - Sensation, Pain, Objective. Symptoms come from three sources – proving, intoxication and clinical. Whereas formerly the emphasis was on symptoms from clinical observations, now by the addition of more proving symptoms, a better balance has been achieved. This has been made possible by the addition of Allen’s Encyclopedia which concerns solely provings and intoxications.